These Christmas Candles can be done in so many different ways. You can set them out on their own, clip them on the tree, or set them in an old-fashioned candle holder! A cute and easy craft! Preschoolers will need help making the flame, but they can decorate their candle all by themselves! 1. Cut out a piece of paper that will fit around your paper tube. Decorate the paper with markers, crayons even Christmas stickers or stamps. You could also add some small embellishments like glitter or sequins, just make sure you don't use a lot of glue or paint, it will make the paper ripple and your candles will look funny. Glue the paper around the paper tube. 2. To make the flame for your candle hold the pipe cleaner about 1" up and begin to wrap it around a thick marker or highlighter. Wrap about half of the pipe cleaner around the marker. 3. Remove the marker and insert a pencil into the center of the pipe cleaner. Wrap the rest of the pipe cleaner around the end of the pencil. This will make the flame taper off at the top. 4. 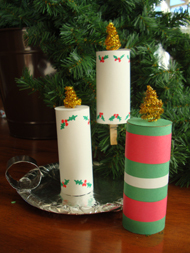 On a piece of paper the same color as your candle, trace around the end of the paper tube and cut it out. Make a small hole in the center of the paper circle with the end of a pencil or scissors. Insert the 1" pipe cleaner tail into the hole, slide it all the way down so the wide end of the flame is sitting on the paper circle (you could add a dab of glue if you want to the place where the pipe cleaner meets the paper. 5. Glue the paper circle/flame onto the top of your candle, and your done! Keep reading for some other ways to display your candles! 1. Wrap tin foil around a dessert-sized paper plate. Cut a small piece of construction paper in to a 4" strip. Wrap the strip in tin foil. 2. Glue your tin foil strip into a ring and glue it onto the side of your paper plate. Place you candle in the plate and enjoy! 1. Glue a clothes pin to the inside of the paper tube. Make sure it is good and dry before you try to put your Christmas Candle on the tree! 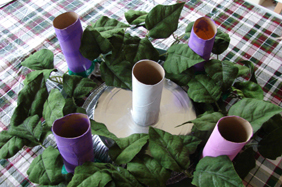 Use your TP roll candles to make this adorable advent wreath just like Julie S. from Eastern, WA did! Julie painted the candles to correspond with the Advent wreath colors: purple, pink, white and then arranged them on a plastic/silk leafy wreath. She also added a battery operated votive, which was the perfect fit inside the tp roll! She took it a bit further and added the words to each candle that it represents (like "Hope"). What a great idea Julie, thanks for sharing!